…with three holes in his heart, but we were blessed that they closed on their own and he never required surgery. He also has cataracts and at thirteen he was diagnosed with scoliosis. Again, we are blessed that it has not required any corrective action other than regular stretching exercises. At seventeen, Ryan loves life and all that he can do. He is active in sports and participates in Special Olympics basketball and the Hudson Booster’s Challenger baseball league. He is also actively involved with the Hudson High School football and basketball teams as a manager. He loves hanging out with “his boys”. He is an awesome cheerleader for his favorite teams (Hudson Raiders, GB Packers, WI Badgers, Brewers, and the Bucks. You will also find him cheering the loudest at all of his sister’s sporting events as her biggest fan. When he’s not in school, playing a sport, or watching one, he enjoys being in the woods or on a lake. 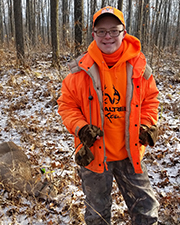 He enjoys spending time at “the shack” in Northern WI with his Grandpa, Dad and hunting buddies. Ryan continues to inspire all of us on a daily basis with his positive attitude and has taught us to appreciate the little things in life, to work hard, and have fun! Web Development Provided by Scope 10 - A Hudson WI Digital Media, Marketing & Web Services Co.